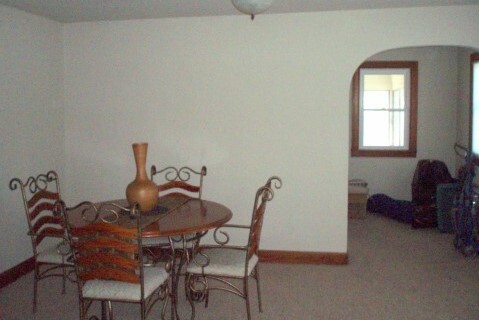 As you can see, the living room started out pretty bare and boring. When Jon moved in, he was living in true bachelor fashion with nothing but the table and chairs. On one of my weekend trips to visit him, I came up early and surprised him by doing a mini makeover on the whole house for about $100. 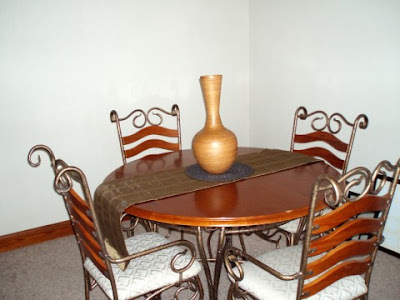 The cost of which, in this room, went to a wooden vase, decorative metal placemat and table runner. Needless to say, there was still a long way to go in making this room look good. When trying to figure out how I could make the table a little more bearable, I thought about painting the wrought iron black and recovering the seats. But upon further contemplation, I knew that the overall style was not for me, and it all just had to go. Not to mention the fact that the size of the table was nowhere near the right size for the room and only offered seating for four. So we called Salvation Army to pickup the table and chairs (amongst other things), and I got to shopping. I found this table on Craigslist for a whopping $50 (I love Craigslist!). I wish I had a real "before" picture of it, but here it is after Jon sanded off the original stain, which was similar in color to his old dining room table. As mentioned here, we were going for a similar look to a table we'd found at Pottery Barn for $1200. Next Jon removed all of the borders and braided faux wood detailing that had been glued to the side panels and applied the ebony stain we'd picked out at Lowe's. After some hard work and several coats of stain and polyurethane, we had a beautiful new dining room table! I had purchased several new table runners on sale at Pottery Barn that were perfect for our nice, long table that could now seat 8 when the leaf was in. But after some measuring, we decided the table would best fit the room when the leaf was out, thus shortening the table and making my new table runners look entirely too long. So the original, shorter table runner was put on the table, running the width of the table instead of the length. We also went and bought a few new pieces of furniture, a china cabinet and server, so we could get our wedding gifts out of the boxes and out on display! I'd always dreamed of having a dining room server and since we had the space for it, I jumped on the chance to buy one. 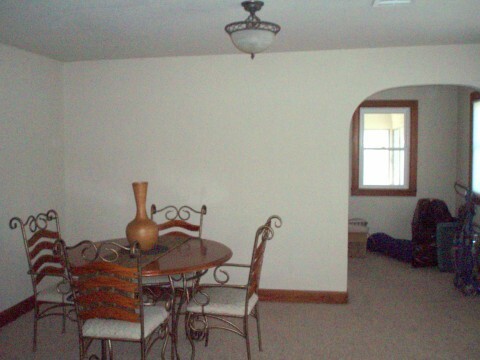 Now all that was missing were the dining room chairs, an integral part of the dining experience. So the search began! Originally, I wanted some Chinese Chippendale chairs, but after not finding any that fit into my budget (no more than $150 per chair), I started looking for my second favorite idea- slipcovered parson chairs. I knew I wanted something white or cream to balance out all of the dark brown and black furniture and ended up finding these lovely Padma Plantation chairs. The color is perfect, and I love the bow detailing on the back. And voila! We had ourselves a new dining room. If we weren't renting or staying here for less than a year, I would have loved to have added some paint to the walls, but as with everywhere else in the house, our furniture and decorative pieces will have to do the job for now. All in all, I think it was still quite the transformation. Looks great! Love the parson chairs :) Awesome job!